CAMERON, Ariz. -- Off a northern Arizona highway surrounded by pastel-colored desert is one of the starkest examples of drought's grip on the American Southwest: Nearly 200 dead horses surrounded by cracked earth, swirling dust and a ribbon of water that couldn't quench their thirst. 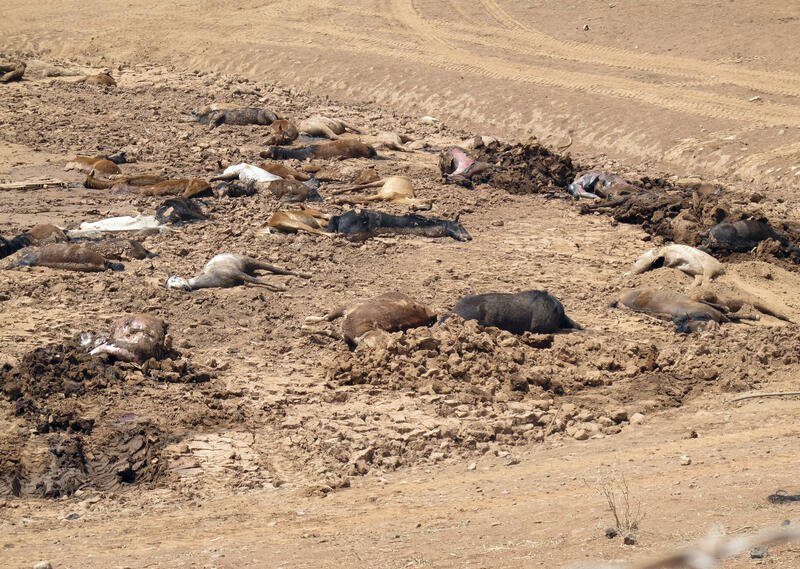 Flesh exposed and in various stages of decomposition, the carcasses form a circle around a dry watering hole sunken in the landscape, CBS affiliate KPHO-TV reports. It's clear this isn't the first time the animals have struggled. Skeletal remain are scattered on the fringes and in an adjacent ravine. It's a symptom of a burgeoning wild horse population and the scarcity of water on the western edge of the Navajo Nation following a dry winter and dismal spring runoff. "These animals were searching for water to stay alive. In the process, they unfortunately burrowed themselves into the mud and couldn't escape because they were so weak," Navajo Nation Vice President Jonathan Nez said in a statement Thursday. Conditions aren't forecast to improve anytime soon, and tribal officials suspect other animals have died with not enough to eat or drink. "One of the things we do is we picture the worst-case scenario when we got out there," said Harlan Cleveland of the tribe's Department of Emergency Management. "I did smell the decomposition and the bodies starting to smell, the carcasses. But I didn't realize until I looked down from the berm and saw all those horses down there." Here, drought doesn't manifest in having to shut down swimming pools or let lawns go dry. Animals were accustomed to finding relief at the stock pond where the horses died, but locals say the pool of water beneath the decades-old earthen dam has dried up more quickly each year. Families have been downsizing their herds because they can't rely on the vegetation or watering holes. Some have hauled water and left it in troughs for animals. Charlie Smith Jr. climbed the small berm overlooking the watering hole three weeks ago in search of his cattle. At the time, he counted 29 dead horses and a cow that wasn't his stranded at the edge looking up at him. "It's very emotional," he said, standing beside his truck loaded with hay. "I kept calling my sister saying 'this is bad.' It just hits you. You tear up. You know you don't have the capability to save them." Tribal officials counted 118 dead horses and two cows this week but that tally doesn't account for any carcasses that might have been pushed deeper into the mud by the other struggling animals, or for skeletal remains. Tribal officials estimate tens of thousands of feral horses on the Navajo Nation, the country's largest reservation spanning 27,000 square miles (69,929.679 square kilometers) in Arizona, Utah and New Mexico. Some communities have called for roundups, but often they're halted with public outcry tied to Navajo spiritual beliefs about the animals and the role they play in prayers and ceremonies. "There were no feral horses back then, but then the society changed in greater America but on Navajo, on the reservation as well," he said. Federal and tribal workers this week used heavy equipment to bring horses found on the outskirts closer to the others. Hydrated lime was spread over the site to aid decomposition and to ward off scavengers. Friday's work focused on collapsing the berm and burying the animals on site. "Knock on wood, God forbid, that we have that situation anywhere else within the reservation," Cleveland said. "This will lay the foundation for how we respond to this." For all the devastation, there was a bright spot. As Cleveland surveyed ground earlier this week determining how best to respond to the deaths, he saw a foal - no more than four weeks old - moving next to what was assumed to be its mother. "In the end, that made my day responding to this emergency and this chaotic scene," Cleveland said. "At least this baby foal made it out."